Sometimes I need help. So do they. I need tools to help deal with my life. So do they. One of my powertools of choice is – MATH. During a 5th grade music class this past week the subject was rhythm. We explored tempo, beat and I taught them to write various rhythms and clap them at sight. We also worked on scales and a single note’s relationship to others around it. Those discussions invariably turn to math. Students fight that connection. They cannot be friends or even distant relatives. AH, BUT THEY ARE, MY YOUNG PADAWAN LEARNER. All music is math. Tempo, rhythms, harmonies, melodies, if there are words, how they interact with each other and all the above. 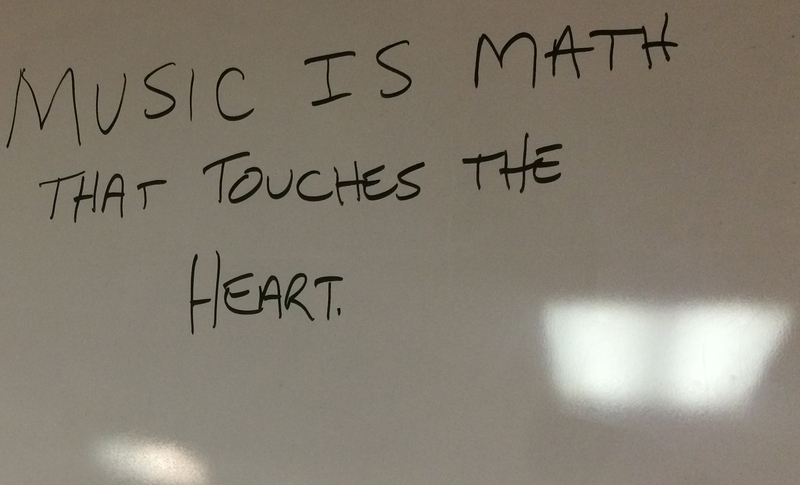 Music is math that touches the heart. Noise fills our lives. We swim through it – awake and aware or it is the soundtrack of our dreams. From birth to death it clings to every molecule of the air we breathe. And for some of us, sometimes, the volume of that noise reaches such a level that we are driven into the valley of the shadow. That’s how it feels for me. It is different for you I’m sure. Sometimes, I see the dark cloud move in and hover over my kids (all 80 of them). In general, math is concrete. The relationship between one number and another is and always has been consistent. Music is the same way with one exception. The consistent relationship between one musical sound and the next is miraculous. The math of music – its Tao – can warm the atrophied heart and melt tears from the eyes of statues. If I can get a child who is in a bad place to a piano and play or sing even one note – something inside changes. Attention diverts from chaos to order. Even if only for a millisecond, music opens a crack that lets light into the darkness. The opening process could take seconds or years. The a-emotional tool of math mixes with miracle and creates the omni-emotional tool of music. And that is why teaching music in schools and churches and societies is so life and death important. Music offers a handhold to grab as one slides into the valley of the shadow. She also provides rungs to help one climb out. Music is math that touches the heart and in the process, reveals aspects of the Ultimate Dancer that are invisible without it. If you are a music teacher or choir director or if you know someone who is, please pass this post to them or send them to this website. Have them subscribe to my newsletter “The Weekly Word“. Take it for a test drive. It offers free weekly tips and tools for helping them do what they do better.